Article 1 in the Universal Declaration of Human Rights states that ‘All human beings are born free and equal in dignity and rights. They are endowed with reason and conscience and should act towards another in a spirit of brotherhood’. 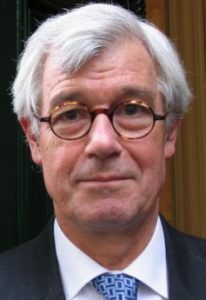 Julian Burnside, AO QC is a renowned human rights and social justice advocate who has devoted his life to creating positive change in this area. Come hear him speak at this special opportunity for those in Melbourne or visiting on the 25th July. You can buy tickets now and join the Facebook discussion in the lead up here. The Citizen Advocacy Trust believes that enduring relationships have the best capacity to protect people with an intellectual disability from harm and provide a sense of belonging to, and connection with, their community. 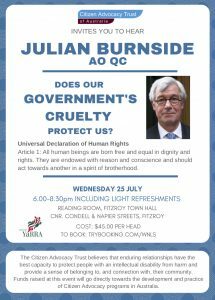 Funds raised at this event will go directly towards the development and practice of Citizen Advocacy programs in Australia. You can also download a copy of the flyer below.